Thanks for your votes and a successful Taste Tour! Greetings from Downtown Northfield! Thanks to everyone who came out to make our first ever Downtown Northfield Taste Tour food crawl such a big success! On Thursday, June 15, the sun was shining, the food was amazing and we sold more than 3000 tickets in just two hours. Eleven downtown restaurants participated in the inaugural event and the variety of offerings was terrific. Everyone enjoyed the free Northfield Community Band concert afterwards in Bridge Square. Next year, we’re hoping to make the event longer and add the breweries to the tour. Save the date for June 14th, 2018! Congratulations to DeLand, Florida, the winner in the “America’s Main Street” contest! 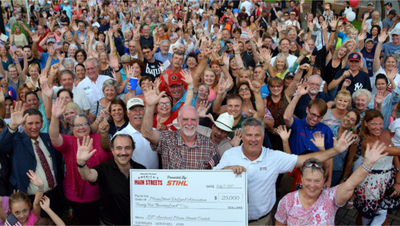 Deland, Florida supporters with a $25,000 check! 242 Main Streets in 48 states were nominated for the title, and more than 300,000 votes were cast. 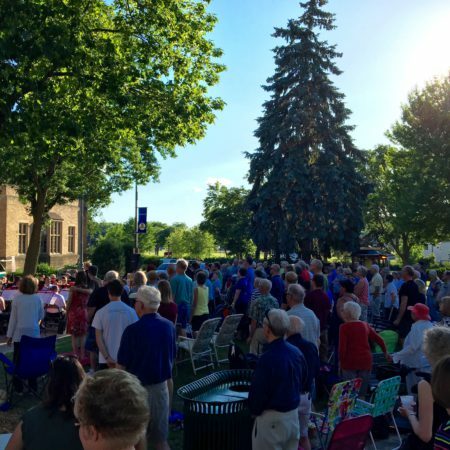 Because of your votes, Downtown Northfield made it into the Top 25 main streets in the nation. It is the people that make our downtown the central heart of our community–thank you and stay tuned: they’ll do it again in 2018!! 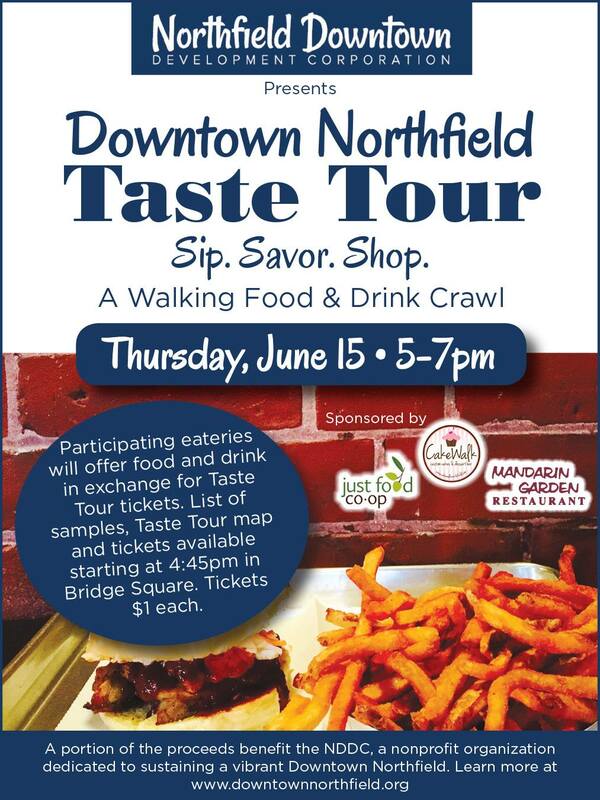 The NDDC will host a food crawl event on Thursday, June 15th from 5-7 pm in Downtown Northfield. The walking Downtown Northfield Taste Tour features small servings of food and drinks at 12 downtown locations. Taste Tour tickets will be sold at Bridge Square starting at 4:45 pm for $1 each and most food samples are priced at 1-4 tickets. “We want to kick off Summer by inviting everyone to gather downtown to enjoy a taste of our local restaurants,” said Jenni Roney, Executive Director of the NDDC. 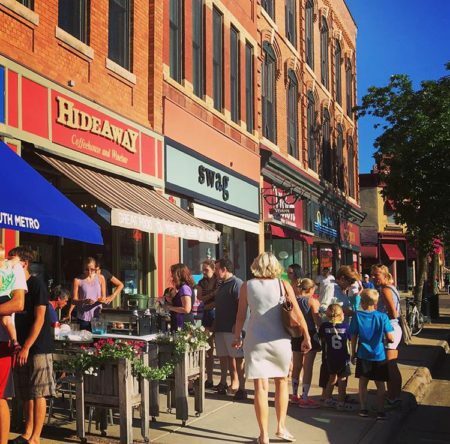 Stops on the Downtown Northfield Taste Tour include: Cakewalk, Chapati, The Hideaway, Hogan Brothers, J. Grundy’s Rueb-N-Stein, Just Food Co-op, Mandarin Garden, Northfield Olive Oils & Vinegars, Quality Bakery, Smoqehouse and Tandem Bagels. The Northfield Historical Society will be offering Post Consumer Brands cereal samples in conjunction with their new Malt-o-Meal exhibit. Those who buy samples at four or more stops on the Taste Tour can enter in a drawing to win a two-night stay at The Archer House River Inn in Downtown Northfield or The Hotel Winneshiek in Decorah, Iowa. Several retail shops will have Third Thursday specials and the Community Band will give a free concert in Bridge Square at 7 pm.